Metz is located in Lorraine, in the northeast of France. It is located 60 kms of Luxembourg and Germany. The workshop takes place at Supelec, 2 rue Edouard Belin, 57070 Metz, France. A lot of solution are possible to come to eNTERFACE 2012. From Paris and Luxembourg : take A4 highway to Strasbourg. Exit the highway at "Metz Est" and take the direction "Borny, Technopole Metz 2000". Then follow the map. From Strasbourg and Germany : take A4 highway to Paris. Exit the highway at "Metz Est" and take the direction "Borny, Technopole Metz 2000". Then follow the map. From Nancy, Lyon : take A31 highway to Luxembourg. Exit the highway at "Fey" (exit number 29) and take the direction of Saarbr�cken. Take the "Metz technopole" exit, and follow the map. Metz is connected to France and Europe at the A�roport Metz-Nancy Lorraine. International airport code is ETZ. At the airport, you can take a taxi to Supelec, or take shuttle to Metz's train station. Another solution is to take a flight to Roissy-charles-de-Gaulle, near Paris, and take a flight ticket with TGV air. TGV comes from Roissy station to Lorraine TGV station. From Paris : Metz is connected to Paris Est station in 85 minutes. From other french city : you can take a TGV to Lorraine TGV station. From here, you can take a taxi. To take the shuttle to Metz Station, you have to take a ticket from your train station up correspondance to Metz in Lorraine TGV. From Metz station, you can take a taxi. 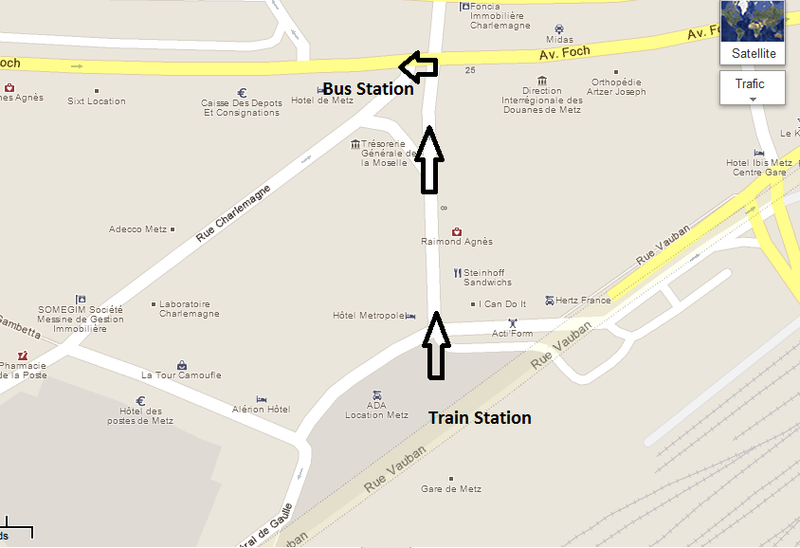 From 8 AM to 9 PM, you can take the bus 8 direction "Grange aux bois" and stop at Technopole station. The frequency of bus is 15 to 20 minutes. → Monday to Saturday, the last bus leaves at 08:20 PM. → On sunday, there are not many buses. After July 7, bus schedules are not yet available. GPS position is +49� 6' 13.52", +6� 13' 23.70" .